Behold & Reflect: Reflections on "Half the Sky"
I've been reading Half the Sky by Nicholas Kristof and Sheryl WuDunn bit by bit over several months because the atrocities it exposes are so graphic and heart rending. While each chapter drew me in, it's not exactly easy reading because of the emotional investment. But I still heartily recommend it as an antidote to complacency and discontentment and ignorance. 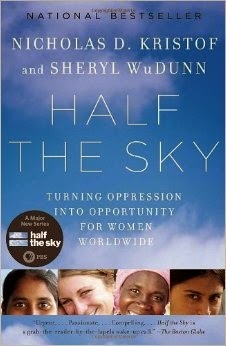 In 14 chapters, Half the Sky takes readers from impoverished villages in the Middle East to seedy red light districts in Asia to bare bones hospitals in Africa where corruption and indifference toward women lead to countless stories of culturally ingrained oppression and violence against women. Kristof and WuDunn also show the effects of female oppression on children and economies in general, driving home the point that injustices women face are not mere "women's issues" but human rights issues. Despite the heavy content, I didn't close the book in despair. Each chapter begins with an impressively intimate portrait of a real woman in a destitute situation and ends with that same woman, against all odds, finding her footing and helping others. Most of these vignettes are also paired with a profile of an aid organization or another woman that helped her. The authors (who happen to be a Pulitzer Prize-winning power couple) encourage readers to take action, supporting grassroots efforts that effect the most bang for buck. They also urge people to travel and meet those they support to gain a fuller understanding of women's experiences worldwide. Before I finished this book, I'd already followed the authors' lead and signed up for a Kiva.org account, where members can make micro loans to individuals on the other side of the globe.